Visit Mongolia’s renowned national parks. I’ve been meaning to write to you and thank you for the wonderful trip to your magnificent country. Every time we turned a corner there was something new and different to experience. Serjee was a wonderful guide; we enjoyed very much being with her. She obviously loves Mongolia and was willing to share so much of herself (and her family) with us. Visiting with her parents in their home was certainly a highlight. The drivers were the best. We all felt very safe with them thru the mountains, rivers, whatever. They participated in activities with us. And even though they didn’t speak English we all communicated. Everything else was great. This was one of the best trips I have ever taken. Thank you for offering it to us so we could see your wonderful country first hand. The Gobi Desert is a dream destination for many travelers! You will get to explore Ulaanbaatar before flying into the South Gobi Desert to explore the world's largest sand dunes, the majestic 'flaming cliffs' where many dinosaur eggs were found, go for a camel ride, and then fly back to Ulaanbaatar to visit Mongolia's largest festival, the Naadam festival! Naadam is the one and only Big Event in Mongolia –a lively national festival, held every year from the 11th – 13th July. Naadam means “three manly games”. Known as the world’s second-oldest Olympics, it celebrates what defined civilization in the Steppes eight centuries ago; archery, wrestling and horse riding. The competitors in the riding events are all children aged between five and twelve, many of whom have been in the saddle since the age of one. As they race along the plains for 20 kilometers, thousands of spectators line the remote track to watch up to 650 children sitting confidently astride their small but sturdy Mongolian steed. It is claimed that such equestrian skills won Genghis Khan an empire that stretched from the Sea of Japan all the way to Europe. In recent times, women have been allowed to enter and they now compete in two of the three events, horse racing and archery. Once a religious ceremony, the festival now formally commemorates the 1921 revolution when Mongolia declared itself a free country. Upon arrival at Chinggis Khan International Airport, you are met by tour guide and transferred to the hotel in the city center. The first stop is at Sukhbaatar Square, which is the central square named after the revolutionary hero of 1921 Damdiny Sukhbaatar whom declared independence from China. You will visit the Gandan Monastery that is the largest and most famous functioning monastery in Mongolia; here you may experience the monks in worship and see the impressive Golden Buddha Statue of Migjid Janraisig. Time permitting you can visit the Natural History Museum which is famous for its authentic dinosaur skeletons and also visit the Zaisan memorial hill to get a fantastic view of whole city. You will have a welcome dinner at local restaurant. 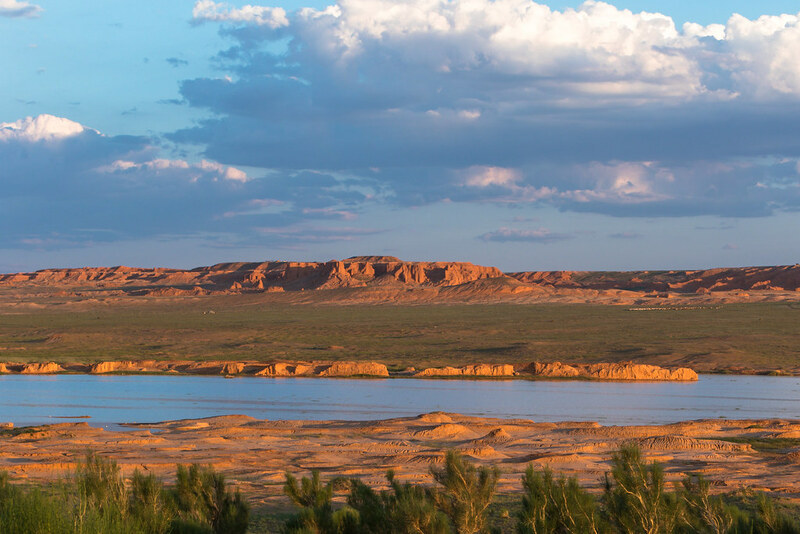 Drive to flaming cliffs known as Flaming Cliffs is located 20 kilometers away from Bulgan soum, a lot of Paleontological findings have been discovered here. The place is known as 'Flaming Cliffs' was named by Roy Chapman Andrews, an American explorer who had visited Mongolia in 1922 and over the course of two years he searched throughout the Mongolian Gobi Desert and found dinosaur fossils and dinosaur eggs about 10-15 cm. It was the first discovery of its scale and kind in the world that had been made at the time. 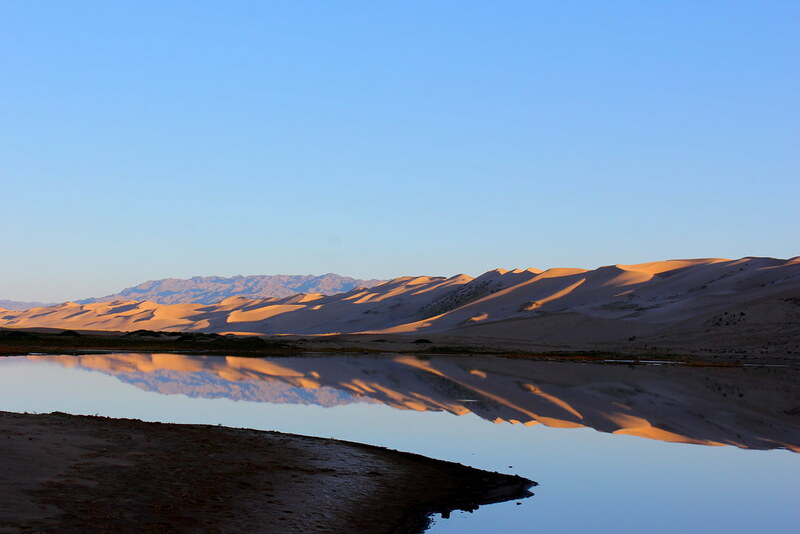 After breakfast, take in the stunning scenery of the Gobi-Altai Mountain range as you transfer to the towering sand dunes of Khongoryn Els, home to the ‘Singing Sands’. These spectacular dunes got their name from the noise made by the shifting sand in the wind. Feel the breeze in your hair as you ride a camel across the dunes before returning to the ger camp. Isolated from the rest of the country, the Singing Sands are the best kept secret for thousand years in the history of Mongolia. We will visit camel breeding family near the sand dune and will ride camel to the sand dune. The dunes seem to stretch on forever like a soft ribbon of sand draped over the desert. The shifting sand blown by the wind or someone makes sound so it is called Singing Sand Dunes. There is a beautiful green oasis known as Seruun bulag near the Khongor River. Return to the camp for lunch and enjoy feeling silence and a peaceful in the beautiful surroundings Gobi Deserts. In the morning, we drive to Yol Valley. Learn about the local wildlife in the Natural History Museum before taking a gentle hike through the valley to discover their habitats. This valley is nestled deep within the hills and is a safe haven to get away from the desert heat. Some areas of the valley are continually sheltered from the hot sun and house huge, blocks of ice that gradually melt away during the summer. It is very wide at the entrance and narrows gradually into a remarkable gorge. You will get to see wild animals such as ibex and wild sheep, and the vulture. You can go horseback or camel riding around the area and go trekking to the gorge. Tonight is your first night in a traditional Mongolian ger camp. Following an early morning breakfast, we are transferred to the Dalanzadgad Airport. We bid farewell to our drivers and fly to Ulaanbaatar where we meet our local transport and then we are transferred to Gorkhi Terelj National Park. Upon arrival at the airport, meet your driver and you are transferred to Gorkhi-Terelj National Park. This unforgettable excursion will take you to features such as unique rock formations, scenic valleys, a winding river, and restful groves of trees. 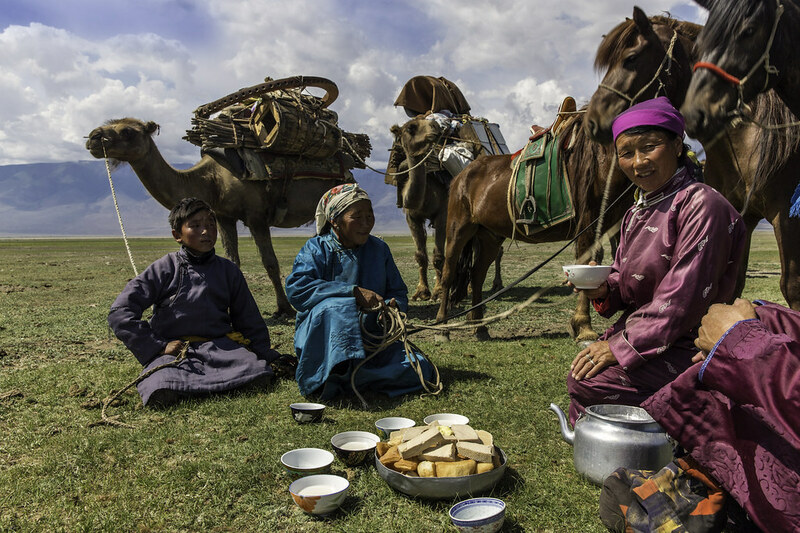 Many nomads live in the park itself, where they find lush grazing land for their animals. You will take a tour in the park and visit the notable rocks called "The Turtle rock", and “Monk reading a book". You will visit the Aryabal meditation center and learn more about Mongolian Buddhism. On the way, you will take a detour to visit the giant Statue of Chinggis Khan which stands 40m (132 ft) high. The monument is about 33 miles east of Ulaanbaatar and stands at the point where according to the legend, he found a golden whip. The statue is symbolically pointed east towards his birthplace. It is on top of the Genghis Khan Statue Complex, a visitor centre, itself 10 meters (32 ft 10 in) tall, with 36 columns representing the 36 khans from Genghis to Ligdan Khan. It was designed by sculptor D. Erdenebileg and architect J. Enkhjargal and erected in 2008. We will drive to Hustai National Park Hustai National Park is the site of a unique re-introduction scheme of Przewalskii’s horse (Equus przewalskii), called "takhi" by Mongolians. It became extinct in the wild in 1969 and, since 1992, has been successfully re-introduced to Hustai from zoos around the world. This has been an international effort monitored by The Foundation for the Przewalskii Horse, based in the Netherlands and MACNE (Mongolian Association for Conservation of Nature and the Environment). The national park is rolling Steppe Mountains with rather large patches of birch and aspen forests. There are also visible remains of Neolithic graves. In addition, red deer (Cervus elaphus) and wolf (Canis lupus) have increased quite a bit during the last few years, as well as Mongolian gazelle. Species present in Hustai but usually not seen include Lynx, Argali Sheep and Roe Deer. The Hustai National Park in Mongolia is world famous for the successful reintroduction of the Prezwalski horse. Upon arrival in Hustai, we check in our ger camp. After wash and change, we will take jeep ride in the park. Usually we are able to see the herds of wild horses grazing in the grasslands of the parks and other wild animals. After breakfast at our camp, we head further west to Karakorum (Locally called Kharahhorin or Harhorin), the symbolic ruins of the 13th century capital of the Mongol Empire. On the way, you may stop for an optional camel ride in the sand dunes. 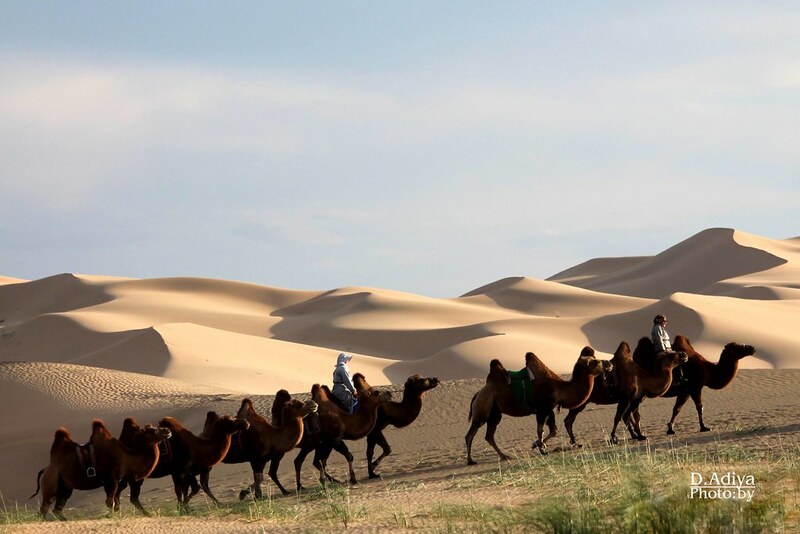 Mounted on the double hump camel, you can wander about the sand dunes and visit the nomadic camps in the area. Next, we will visit the Karakorum Museum and see the Great Mongol state period, Stone Age, Bronze Age, Ancient state period halls. 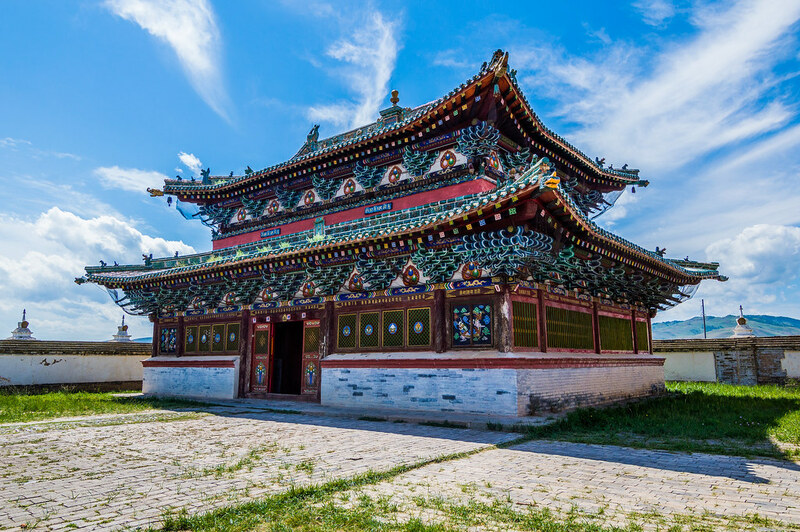 In the morning, we drive back to Ulaanbaatar and there is more to see here upon arrival if you are interested, such as a visit to the Bogd Khan Winter Palace Museum, a residence of Bodg Jabzan Damba Hutagt VIII whom was Mongolia's last theocrat. Or take a leisurely stroll through the town center. In the evening perhaps you can enjoy a farewell dinner and attend the local folklore dance shows. During whole lovely day you enjoy watch Naadam festival or three manly sports such as wrestling, archery and horse racing. Visit opening ceremony of Naadam festival at the national stadium. And you will see archery, wrestling and horse racing during Naadam festival. Naadam festival is of the victory of the People’s Revolution. Naadam festival is celebrated every year at 11-13th July in Central stadium. Mongolia celebrates its independence and its rich cultural heritage with a festival of sports and revelry in Ulaanbaatar. The distinctly Mongolian feel and flair of the Naadam Festival make it a wonderful spectacle, a joyous time, and an intriguing cultural event. Colorful ceremonies and parading soldiers kick off the celebrations. The ancient game of wrestling follows, with men competing in many rounds of competition. Both men and women compete in the archery games, using the traditional Mongolian compound bow that terrorized Europe when Genghis Khan and his Golden Horde moved their empire west. The quintessentially Mongolian art of horse racing follows, where up to 800 horses compete, jockeyed by children so that the skill of the horse, and not the rider, is tested. Transfer to the airport for flight to next destination.